On the other side is a slider card with a sliding butterfly wishing "Happy Birthday"
This is the castle card which is in 3 folds.On opening the front fold a Photo shaker card is seen .I used Deneen's castle card template. 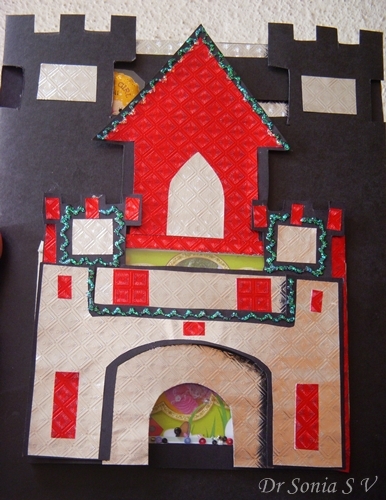 On the inside is a pop up castle [ template from Robert Sabuda]. This card was made for my niece who is a little princess hence the castle theme! 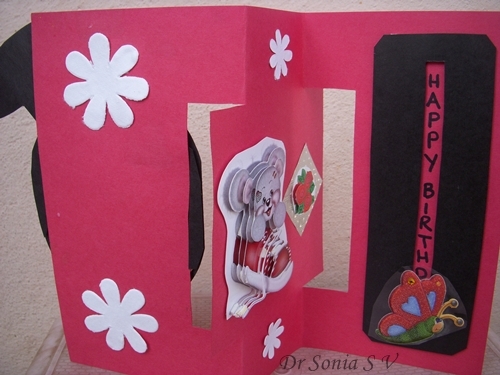 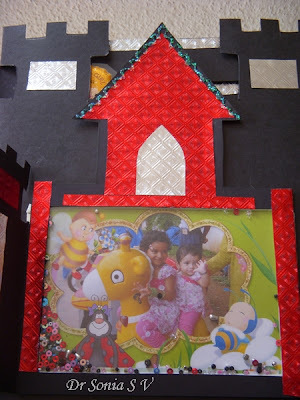 This pop up card was made for my adorable niece for her first birthday.The template is from Robert Sabuda. 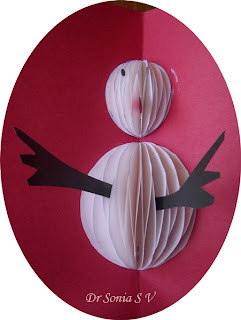 This snowman pop up card is a modified paper ball glued into the inside of a folded card to create a Pop up Snowman with popping arms and nose.We made the paper ball at home by gluing multiple circles of white paper.Instead of a hemisphere make a ball and use it as a snowman Christmas decoration! 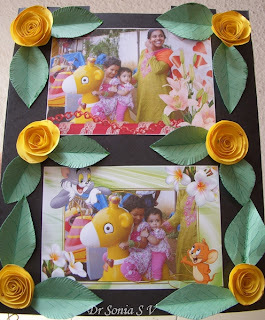 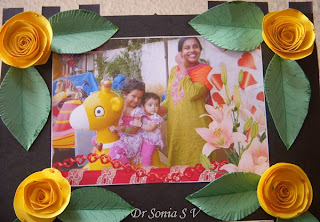 In this Flowers Frame card we rolled up spiral rose flowers and glittered the edges and made a frame for the photograph. This is another ice cream card this time in every little girls favorite color pink!The ice cream scoop swirls come out very well with 3 D liner glitter glue.We used corrugated paper for the cone and the wafer. 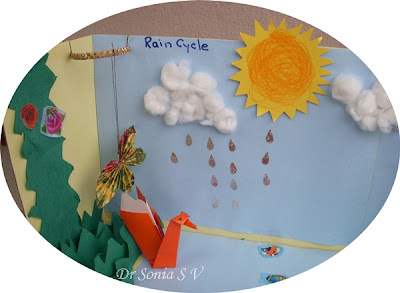 My daughter had the theme Rain cycle in school and wanted to take something to present in class.This Rain cycle diorama has an origami swan in orange [her favorite color! ], a mountain,clouds,fish in the sea and a hanging origami butterfly. She learnt to explain the rain cycle- you can see the silver rain drops falling from the cloudy sky onto the river below. 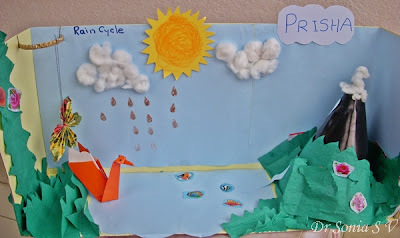 My daughter stuck tiny fish in the ocean and some snow[ cotton ] on the mountain peaks.I let her cut out the greenery for this Water cycle diorama and she beautified her mountain with flowers! I hope our simple diorama can help your kid in his or her school project. 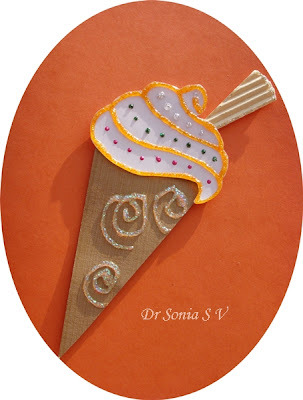 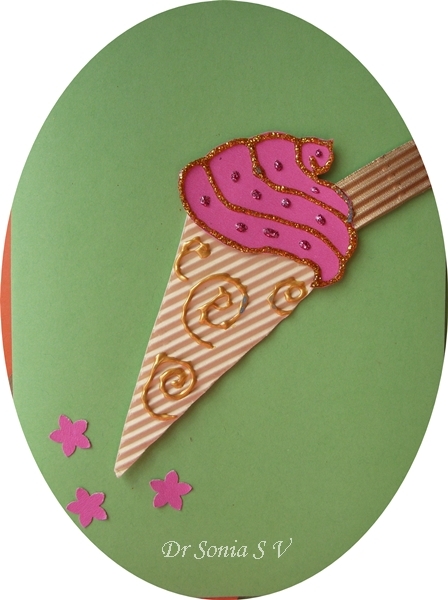 This Ice cream cone card is a lovely Kids Card embellished with 3 D Liner glitter glue. 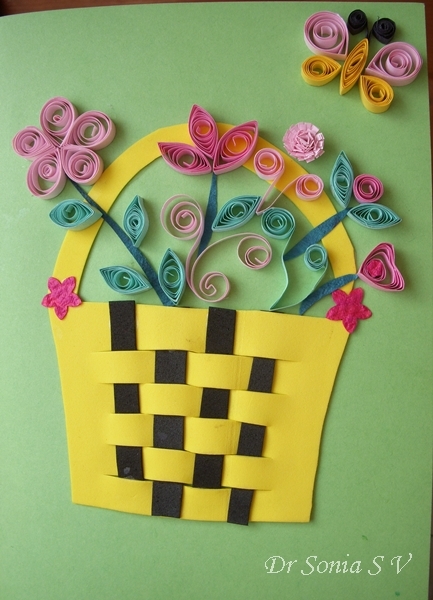 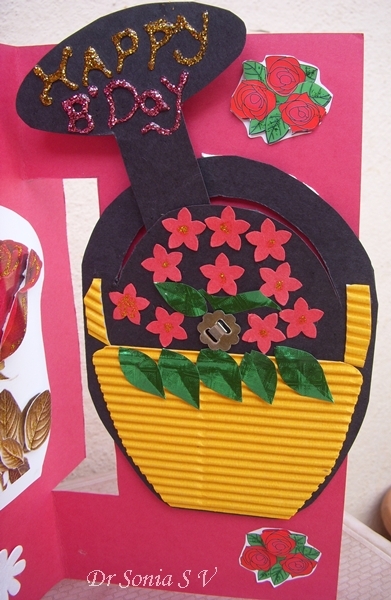 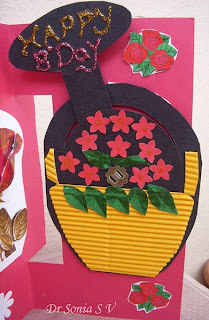 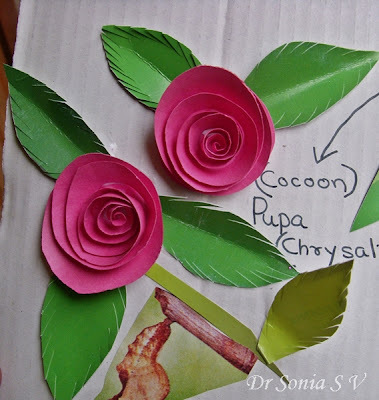 Its a paper piecing card with colored and corrugated paper. 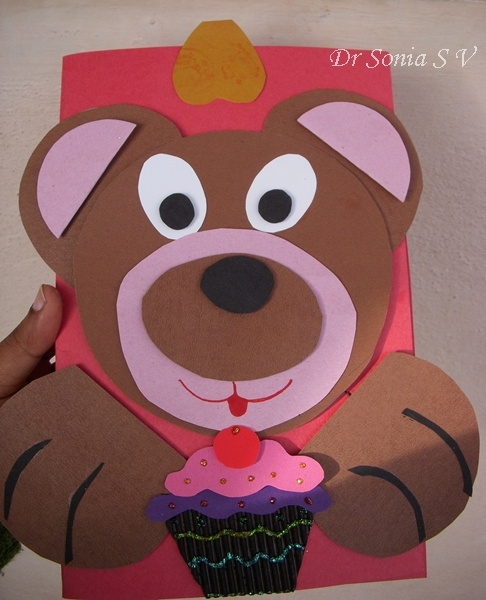 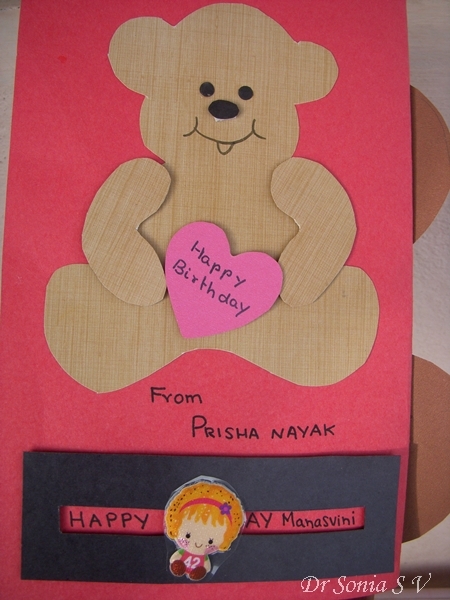 This is a Kids Birthday card using Paper Piecing which is so simple my 4 year old could help do the major part of the front cover.It was for her dear friend so that was very important for her.The Cup cake the bear is holding is another simple Paper pieced project which is easy and effective. 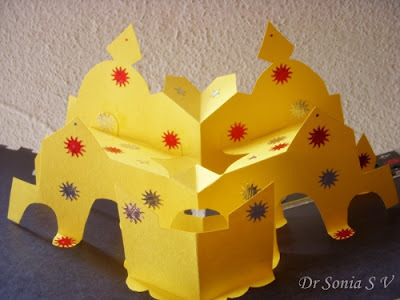 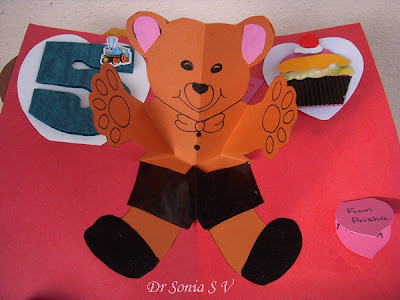 The inside is a Bear Hug Pop up design form Robert Sabuda who so generously shares templates and tutorials.The Number 5 for her fiend's 5th Birthday. 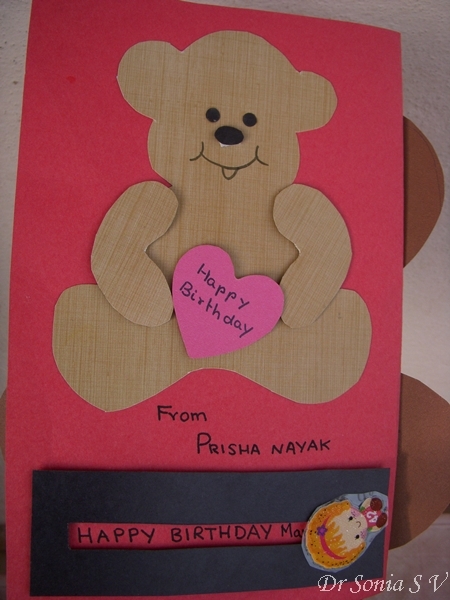 The back of the card has a slider mechanism to wish the birthday girl a Happy Birthday. 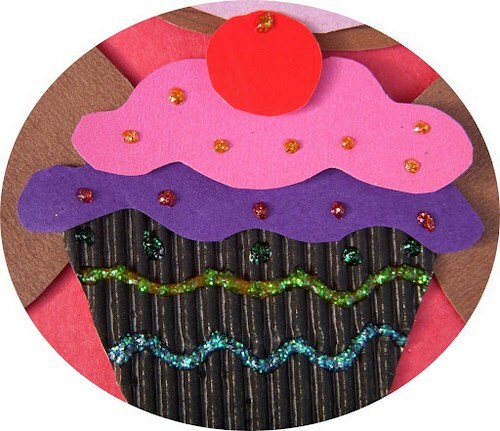 This Cup Cake is made out of corrugated and colored paper.Decorated with glitter glue 3 D Liner.This Cup cake was used in the Teddy Bear Paper Pieced Card. 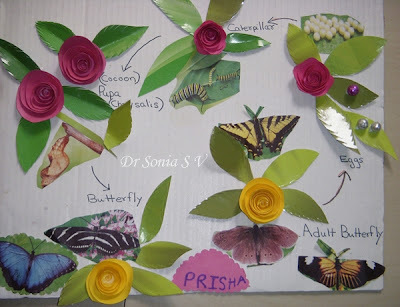 My daughter was learning about the life cycle of insects and this is the Butterfly life cycle we made for her school.She was so proud of it!